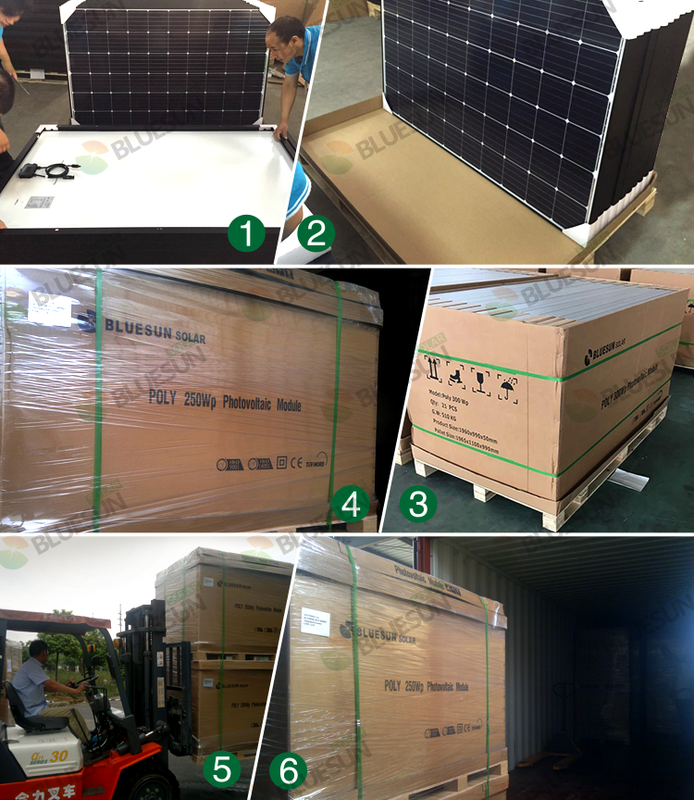 Monocrystalline 150W solar panels and 36 cells series 12V 165W 170W solar panel , normal package is 4 pieces per carton , we accept customized or OEM package too. This affordable, high efficiency BLUESUN SOLAR 165W 170W 175W 180W monocrystalline solar panel is perfect for permanent outdoor use to provide free electricity to charge a 12V battery that can power hundreds of devices and electrical appliances. The long-lasting monocrystalline solar cells and the tough, sealed, aluminium frame will give you years and years of consistent, free power. Waterproof design ensures the panel can be used in all weather conditions. The panel comes with 90CM of special solar cable (customized length optional ) which can work at high roof temperatures and has minimum power losses. The pair of male / female MC4 connectors are crimped on the end of the cable for easy connection to other solar panels, extension leads or your existing system (MC4 connectors can also be cut off when wiring to screw terminals of a solar charge controller). Each individual solar panel has been thoroughly tested at the factory for highest quality standards, and labelled with a unique serial number for further quality control and better warranty protection. Please, if you have any questions or concerns about shipping time and delivery, contact us prior on leaving a negative feedback as we are dedicated to provide you with the best buying experience.You can ask our professional products consultant.